Will ocean carbon uptake continue at the same relative rate as the ocean warms? The ocean plays a major role in regulating the CO2 concentration of the atmosphere. Time series observations from nine ocean stations have verified that the uptake of anthropogenic CO2 by the ocean led to increased seawater CO2 concentrations and decreased pH in seawater in the Pacific and Atlantic Ocean [WMO, 2013 and references cited therein]. About 26% of the anthropogenic carbon released to the atmosphere is currently taken up in the ocean [Le Quere et al., 2015]. The long-term CO2 measurement also show the importance of further observations for seasonal and interannual variability on ocean CO2 concentration and uptake. Numerical models suggest relatively little change in ocean carbon uptake, while the sparse observational data indicate greater variability ([Wanninkhof et al., 2013]; [Landschützer et al., 2015]; [Landschützer et al., 2014]). [Landschützer et al., 2015] noted that the Southern Ocean “sink for anthropogenic CO2 is more variable than previously suggested and that it responds quite sensitively to physical climate variability.” As a result, “the Southern Ocean might lose its recently regained uptake strength, leading to a faster accumulation of CO2 in the atmosphere and consequently an acceleration of the rate of global warming”. Similarly, [Watson et al., 2009] were able to demonstrate that the CO2 sink in the North Atlantic, one of the most prominent sink regions of the world ocean, shows interannual variability by more than a factor of two. A major advance has been the development of the SOCAT database for shipboard pCO2 measurements, which now allows annual estimates of ocean carbon uptake [Le Quere et al., 2015]. However, the data are still relatively sparse and often lack a well-defined seasonal record in most areas. 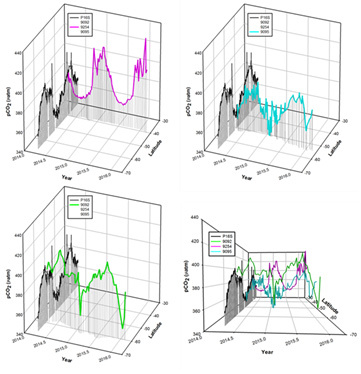 Profiling floats equipped with pH sensors can make a significant contribution to reducing the uncertainty that is introduced by sparse, temporal resolution in most ocean areas when the float data are merged with shipboard observations of pCO2 (see figure). In return, the more accurate pCO2 measurements performed by equilibrator-based pCO2 systems on “volunteer observing ships”, forming the backbone of the SOCAT database, have the potential to provide crucial quality control to float-based carbon observations. pCO2 at in situ temperature measured with a shipboard system on the 2014 P16S GO-SHIP cruise (black line), and pCO2 computed from measured pH in the upper 10 m along with estimated alkalinity [Carter et al., 2016] for three SOCCOM floats deployed on the cruise that have operated for two years.